The Modela MDX-50E CNC mill is an ideal stand-alone modelling solution for the production of short runs, prototypes and pre-production models and final samples. The MDX-50E is also an effective complementary technology to 3D printing as it delivers incredible mechanical accuracy (up to 0.01mm), a smooth surface finish and compatibility with a huge range of materials. 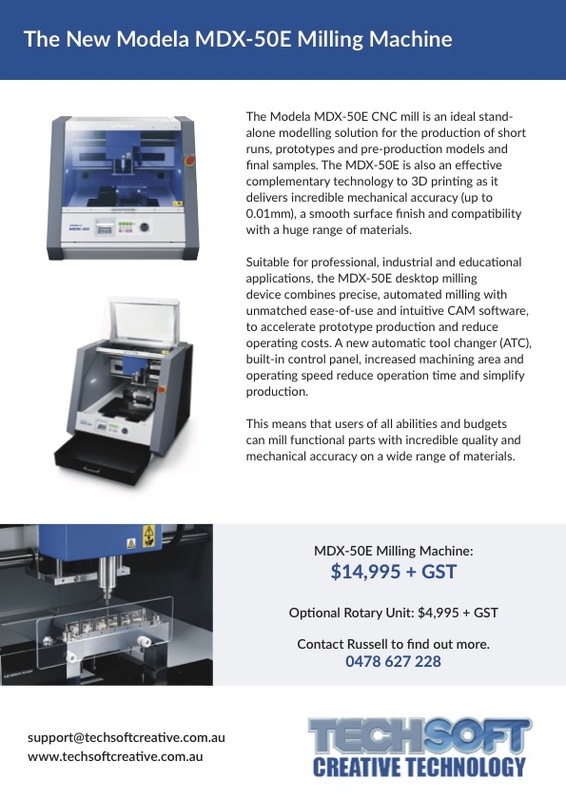 Suitable for professional, industrial and educational applications, the MDX-50E desktop milling device combines precise, automated milling with unmatched ease-of-use and intuitive CAM software, to accelerate prototype production and reduce operating costs. A new automatic tool changer (ATC), built-in control panel, increased machining area and operating speed reduce operation time and simplify production. All D&T departments need CNC milling, it is essential as one strand of modern manufacturing practice. Even laser users need a milling capability for the shapes and processes a laser cannot handle, in particular 3D machining. 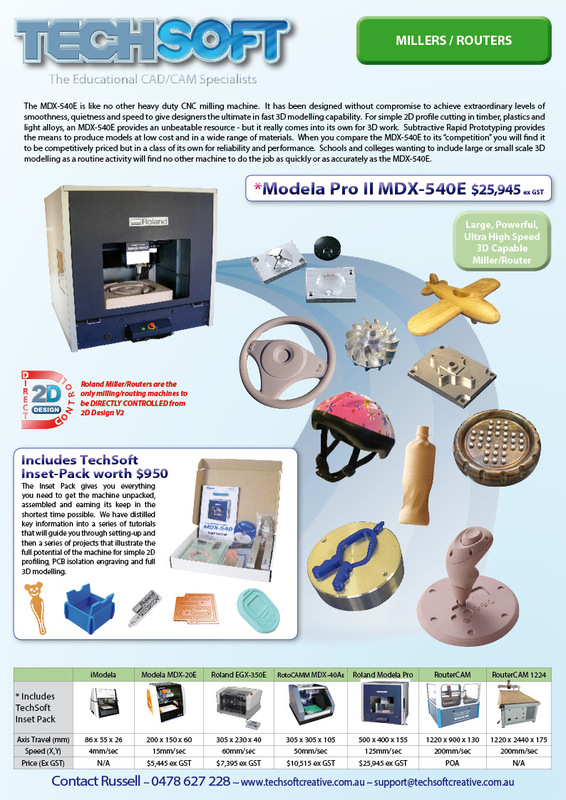 The low cost RotoCAMM MDX-40AE is simple to set up and use, is exceptionally versatile, has a generous machining capacity and a great cutting performance. The optional accessories make it the most versatile machine in its class – it can even double up as a high quality 3D scanner! Software support is built into 2D Design V2, while Visual ToolPath allows the machine’s use with virtually any 3D Design software (eg., SolidWorks). It comes from a proven and trusted manufacturer, and last but not least, it has the backing of TechSoft’s unrivalled technical support. TechSoft also supply CNC milling sytems for smaller budgets and more ambitious projects, see below for details. The Inset Pack is designed to get teachers up to speed as quickly and as painlessly as possible. 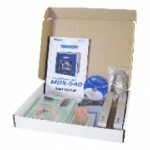 The Inset Course is tutorial based, starting with unpacking the machine! Each subsequent tutorial develops a new skill, or technique, often based on the manufacture of an object that would be typical of a school project (see examples below). All the tools and materials required to make the tutorial examples are included in the pack, as are the special TechSoft collets that make setup and tool change such a breeze. The MDX-540E is like no other heavy duty CNC milling machine. It has been designed without compromise to achieve extraordinary levels of smoothness, quietness and speed to give designers the ultimate in fast 3D modelling capability. For simple 2D profile cutting in timber, plastics and light alloys, an MDX-540E provides an unbeatable resource – but it really comes into its own for 3D work. Subtractive Rapid Prototyping provides the means to produce models at low cost and in a wide range of materials. When you compare the MDX-540E to its “competition” you will find it to be competitively priced but in a class of its own for reliability and performance. 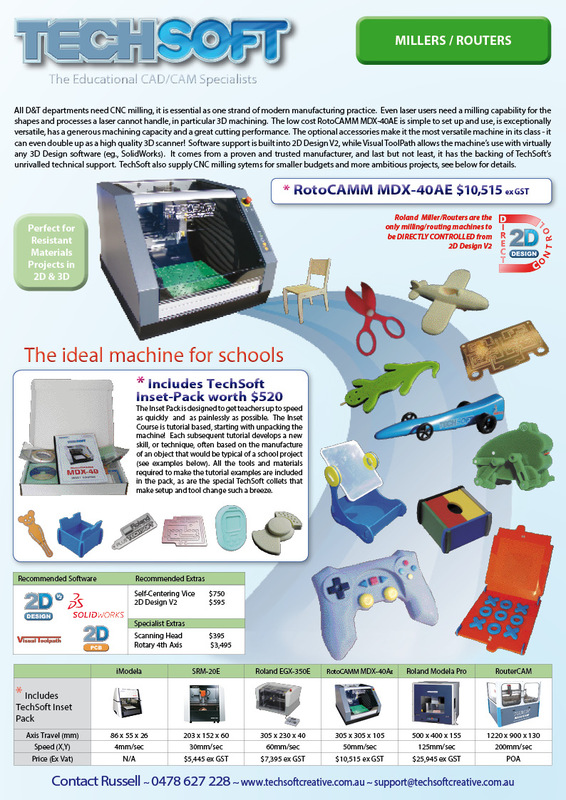 Schools and colleges wanting to include large or small scale 3D modelling as a routine activity will find no other machine to do the job as quickly or as accurately as the MDX-540E. The Inset Pack gives you everything you need to get the machine unpacked, assembled and earning its keep in the shortest time possible. We have distilled key information into a series of tutorials that will guide you through setting-up and then a series of projects that illustrate the full potential of the machine for simple 2D profiling, PCB isolation engraving and full 3D modelling. The SRM-20E from Roland is the much-anticipated successor to the hugely successful Modela MDX-15/20 range. The SRM-20E brings the technology right up to date with faster output speeds, smarter control and cutting edge styling. 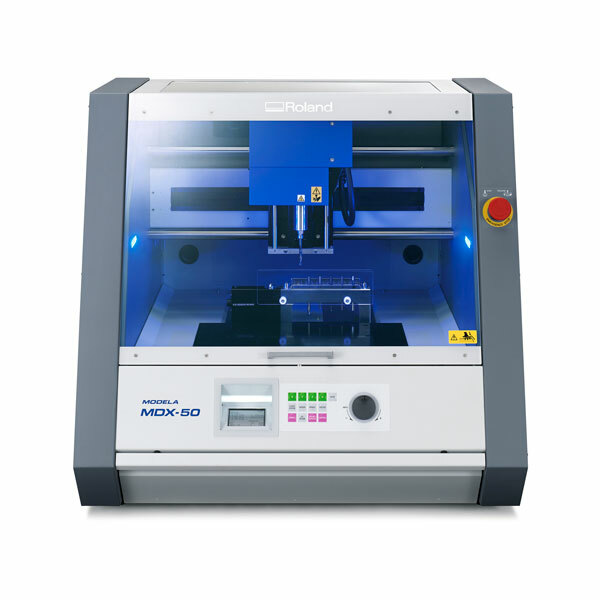 For fast, accurate, subtractive rapid manufacturing, the SRM-20E will machine 3D models with smooth surfaces to a high degree of accuracy. Prototypes can therefore be tested for appearance, tactile properties and mechanical fit. Control is direct from 2D Design V2 for simple 2D profiling and via the included Modela Player 4 software for 3D work. SRM-20E is also compatible with Visual Toolpath – for education this provides a highly visual and intuitive tool for configuring and managing output. 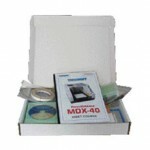 3D files for machining can be created in SolidWorks or any mainstream 3D CAD package that will export in .stl format. The SRM-20 has a modest desktop footprint and will work a range of lighter materials including plastics and modelling board. Although Roland’s entry- level machine, the SRM-20E delivers professional quality models and will be an ideal individual student resource. 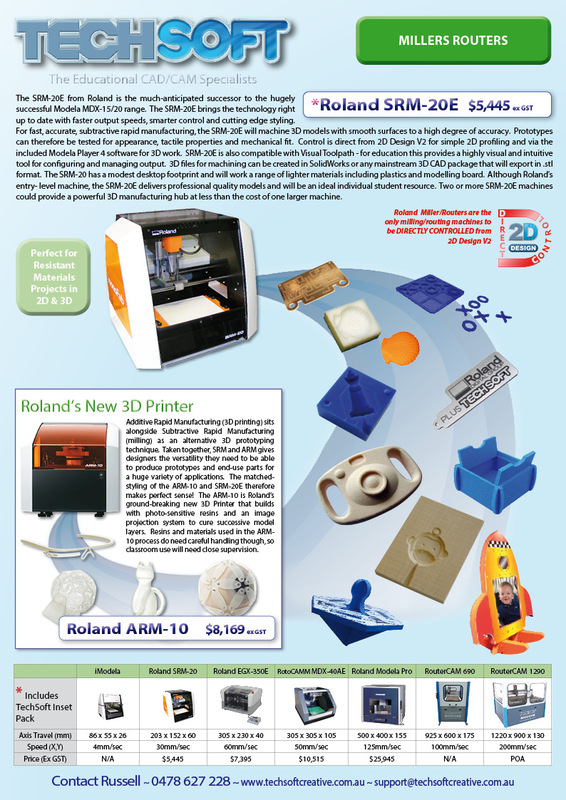 Two or more SRM-20E machines could provide a powerful 3D manufacturing hub at less than the cost of one larger machine.